Spring is perhaps my favorite season of the year. Down here, it's the time when the weather isn't too hot yet to enjoy the outdoors, the flowers are blooming, and everything just seems more intense somehow. When I'm driving (as we all do in Atlanta, all the time), I like to ride with the windows down, enjoying the cool rush of air on my face and just feeling happy. And every year it seems like I have a new album that becomes the soundtrack to this experience, that manages to encapsulate the giddy enjoyment I feel in April and May. 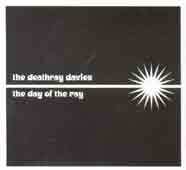 This year, that record is The Day of the Ray by Texas's The Deathray Davies. In the past, I've really considered The Deathray Davies to be one of those bands that are so much better live than they sound recorded. That's not to say that their previous releases are bad, but rather that in concert The Deathray Davies are an amazing blend of skill, energy, and fun. Naturally, that essence isn't something that translates easily to the recorded medium. However, with Day of the Ray they've come the closest yet to reproducing their live sound. From the first notes of this album, you can hear all the signature sounds of The Deathray Davies: crunchy guitars, driving drums, and accenting organ. It's pretty much quintessential retro 60's garage rock -- music you can't help but tap your foot to, even if you don't want to. Of course, these days, many bands sound like this, so what makes The Deathray Davies different? Aside from the sheer talent of the band as whole, one thing stands out: the clever and intelligent lyrics written by songwriter John Dufilho. While most retro sounding bands seem content to replay all the lyrical clichés of the past 40 years, Dufilho manages to come up with different comparisons, such as She Can Play Me Like a Drum Machine. Furthermore, when he sings Dufilho manages to sound humorously self-depreciating, instead of merely petulant and whiny. This may not seem like a big deal to some people, but it's those small touches that elevate a group from being merely O.K. to being excellent. With such a strong delivery, it's hard to pick out the standout songs from The Day of the Ray. The first song, Is This On?, is perhaps the catchiest, with its Ramones-like guitar riff. Similarly, Persuasive Is Your Name evokes the semi-punk of Pain and includes a genuine guitar solo as well as some interesting multi-layered vocals. The afore-mentioned She Can Play Me Like a Drum Machine includes all of the above as well as lyrics that reference Bill Monroe. But my favorite song come towards the end of the album. The Medication's Gone starts off like the soundtrack to a spy movie, with a strong bass line that suggests that perhaps the band should be sneaking through darkened hallways and peering around corners. It's a glorious song whose only fault is ending when I'd like to hear more. Still, on the whole, every song on the album is quite good, and they all sound somewhat different from each other (which is rather impressive on a 13 song record). Hearing The Day of the Ray, I don't understand why The Deathray Davies aren't one of the hyped "next big things" (a la The Strokes or The Hives), for they certainly deserve the recognition. They've got the perfect Karl Hendricks-esque song titles. They've got the talented musicians to perform sing-a-long garage pop songs. Everything flows together smoothly. The songs stick in your head for days at time. In the end, I suppose this doesn't matter; all I know is that this is the best album I've heard thus far this year. Tracers also reviewed The Deathray Davies in concert, opening for Moldy Peaches of all things!